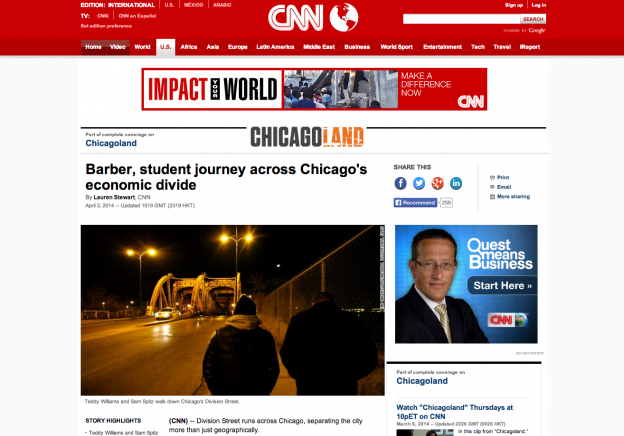 (CNN) — Division Street runs across Chicago, separating the city more than just geographically. Teddy Williams knows this well. He grew up in the 1980s in Chicago’s infamous Cabrini Green housing project on Division, a street he said stays true to its name. Though the neighborhood was notorious for its gang-infested streets and violence, Williams, now 40, remembers the neighborhood differently. He remembers playing with his childhood friends, running up and down hallways of his apartment building, and listening to Slick Rick on big boom boxes. This entry was posted in News on April 9, 2014 by oscar. It was unimaginable. Cabrini Green was a tall high-rise, I think 15 stories high, and you got people standing everywhere. You can’t even get in your apartment. We moved into an apartment on the first floor with boarded-up windows. Sometimes we’d all be out there in the kitchen or reading in the front room and all of a sudden, someone would come by at night and start beating on the boards — scaring my younger brothers and sisters. Read Batman’s full op-ed here. 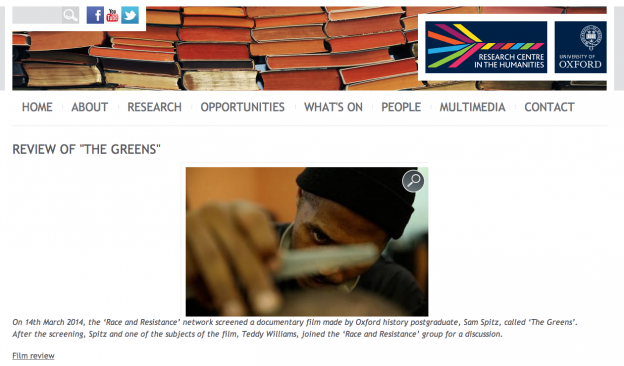 This entry was posted in News on March 19, 2014 by oscar. The clear strength of Spitz’s film for me was the space it allowed Williams and his friend, L.C. 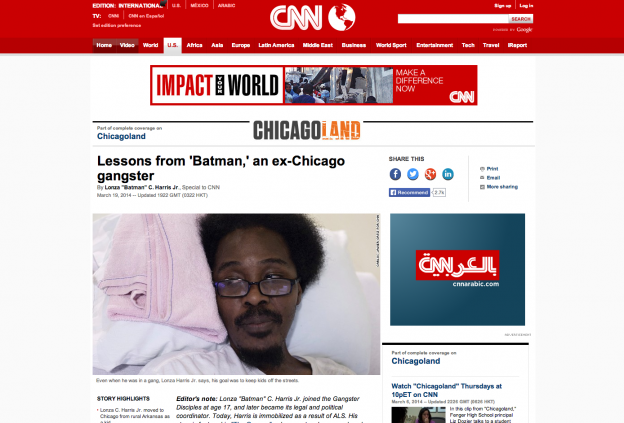 Harris Jr., also known as ‘Batman’, to speak about their lives. Whilst assuming the role of interviewer, Spitz for the most part stays off-camera. Instead we hear directly from Teddy and ‘Batman’ about their memories growing up in Cabrini Green and their sorrow at its recent decline and demolition by the Chicago Housing Authority. Their words are moving and poignant. ‘You can’t take a gun, put it to my head and say, “This is a stick-up, give me your memories”’, Harris says at one point, reminiscing about his early life in the projects. Williams also effectively uses imagery to describe how it felt to watch his childhood home be dismantled, brick by brick: ‘It was like every time a building was tore down you lost a part of your body, like one of your members. Like your leg don’t work no more, then your other leg stop working…That’s how it started to look. Everything started to limp’. This entry was posted in News on March 14, 2014 by oscar. Before showing the film, Spitz asked the audience about their knowledge of Cabrini Green or of public housing. When most people hear the words “public housing” or the “projects,” they immediately think of drugs and violence. And that is exactly what Spitz thought of his entire life about the famous housing project near his hometown in Chicago. Spitz explained that after graduating college and spending a summer in Mexico he came back home feeling lost. He initially wanted to work on a project about the red line in Chicago. In the red line, he met Teddy Williams, a humble barber that would take him on a journey back through time and of self-discovery. This entry was posted in News on October 3, 2013 by oscar. 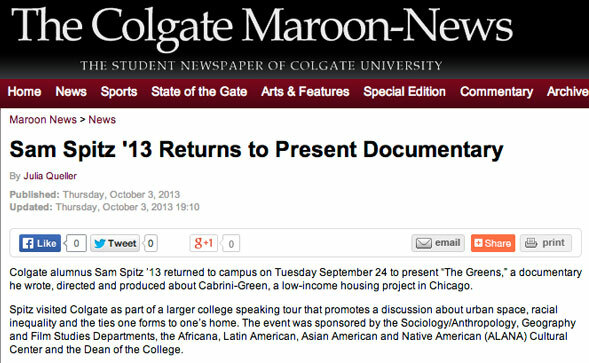 Colgate alumnus Sam Spitz ’13 returned to campus on Tuesday September 24 to present “The Greens,” a documentary he wrote, directed and produced about Cabrini-Green, a low-income housing project in Chicago. 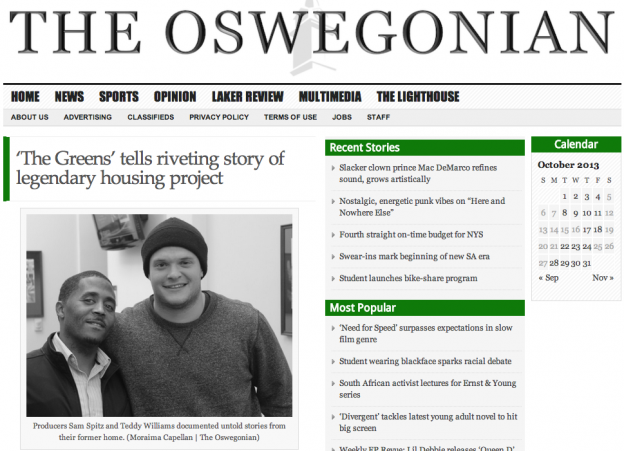 Spitz visited Colgate as part of a larger college speaking tour that promotes a discussion about urban space, racial inequality and the ties one forms to one’s home. The event was sponsored by the Sociology/Anthropology, Geography and Film Studies Departments, the Africana, Latin American, Asian American and Native American (ALANA) Cultural Center and the Dean of the College. Read the full article at the Maroon-News website.